Like our wedding venue hunt, I realize that I never actually shared with you all the story of mine and Ken’s engagement! So, here you go! For more than six months in 2010, Ken and I had been planning a trip to Europe departing in September 2010. We were going to travel in Spain for a week, and then take a week-long Mediterranean Cruise out of Barcelona. We left for Spain on September 25, 2010 and had a great time traveling all around Spain. We visited Madrid, Cordoba, Seville, Toledo (although just for a few hours), and Barcelona. It was gorgeous! In Barcelona, we met up with my sister, her husband, and their 4-year-old son. The idea for the cruise had actually been my sister’s idea and Ken and I said we wanted to go on it too. But we added the week-long tour of Spain ourselves. Our cruise departed Barcelona on Saturday October 2. Our first port of call on the cruise was Villefranche, France (near Nice on the French Riveira) on October 3. We disembarked the ship and took tenders to the land, and then hopped on a train/subway thing from Villefranche to Nice. We were walking around, and Ken kept cough-gagging really badly (remember I talked about that on our wedding day recap? And how he coughs when he’s really nervous, excited, cold, or grossed out?). He said he ate too much for breakfast and his stomach was really upset. 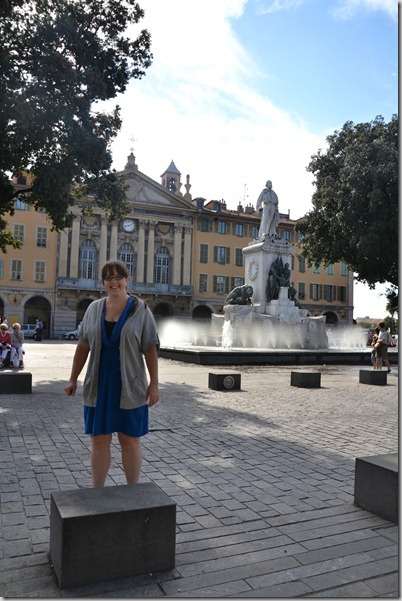 We were walking all around Nice taking photographs and we finally approached the main square of the city. Ken said he needed to take a break from all the walking around and sit down for a while. So, we sat on a concrete ledge surrounding a tree. After we sat for a few seconds, Ken told me to walk toward the fountain in the center of the square so that he could take my photo. As I walked back towards where he was sitting, he was reaching for something in his bag and was getting down on to the ground. It took me a second to realize what he was doing, and when I did, my mind just filled with excitement and my eyes filled with tears. I nodded “yes,” unable to get out the actual word because I was so choked up. He opened a wooden ring box that contained a beautiful sapphire engagement ring. I was truly, genuinely shocked. We had only started talking about rings and stuff a little over a month earlier, so I never even thought that there would’ve been time to find a ring in that amount of time. We sat back down and he told me all the crazy stories and secrets he had been having to keep from me. The one about my ring was especially funny! (again, more on that later). He told me that he thought my entire family already knew. He had talked to my dad about it oh the phone already and apparently my dad had asked if he could tell my mom and sister, and Ken said that was okay. I was all like, “WHAT! !” I couldn’t believe they knew! Then a lot of things started making sense. Before every vacation Ken and I would go on, my mom would always ask, “Are you getting a ring? Do you think you’re going to get a ring on this trip?” I would always get so annoyed. But, as I thought about it, my mom NEVER asked me that question before this vacation! And, it finally made more sense why Ken was cough-gagging. He was nervous about asking me! Later that afternoon, we made our way back to the ship. I called my mom, and he called his mom. Then I called my grandmother, who is hard-of-hearing and will sometimes pretend to hear what you say, even if she doesn’t actually hear you. That’s exactly what happened during my phone conversation with her. Me: Hi Gram, I have big news! I got engaged! Gram: You got a what? Gram: Oh, that’s nice to hear you’re having a good time. After one or two more back-and-forths, she finally hears me. So, she asks about the ring and I tell her about it. Gram: A sapphire??? Why not a diamond? Me: I wanted a sapphire, not a diamond. He got me what I wanted. Gram: What color is it? Me: It’s a blue sapphire. I really like it. Gram: Yes, but it’s BLUE! (clearly disgusted that it’s not a diamond). I gave up and we ended our conversation. A brief, but kind of funny, side story. 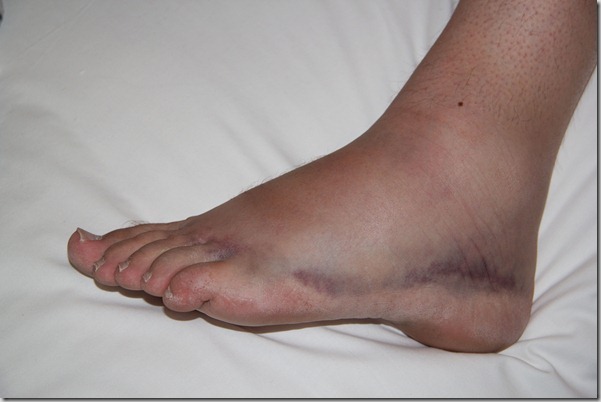 While in Spain, just three days into our two-week trip (Ken had not yet proposed), Ken fell down the steps of a bus and hurt his foot pretty badly. (Coincidentally, I fell UP some steps at the Alhambra the very next day and bruised my shin badly and scraped up my hand. Hence the scraped up ring finger in the engagement ring photo above!). Ken started to sit on the sidewalk right after the fall, but I told him to get up and hobble over to a chair at an outdoor cafe just a few feet away. It’s a long story, but Ken lost consciousness about 30 seconds after his fall, leading me to believe that Ken had hit his head when he fell. So, in the middle of a sidewalk in Seville, Spain, I started to scream at the top of my lungs for someone to call an ambulance (in English, no less). A doctor at a nearby restaurant rushed over as Ken woke back up. The doctor said that if Ken had hit his head, that we should get him to a hospital right away. But Ken said he had only fainted and that he definitely did not hit his head and that he had only hurt his foot. Later that evening, after I had calmed down from such a terrible scare, I called my Mom to tell her the story about Ken’s fall down the stairs, including the part about how he tried to sit on the sidewalk after he hurt his foot and subsequently fainted. Fast forward 4 days, when I was now giving my mom the news about Ken’s proposal. My mom was very excited, and then revealed that when I told her the story about Ken’s fall a few days earlier, that she thought it was all part of Ken’s grand proposal plan. That he had “pretended” to fall and would get on the sidewalk to propose. She was really excited with the story at that point! But then, she was very surprised at how the story about the fall had ended. Not with a proposal, but with a loss of consciousness. Luckily she had kept the secret and didn’t blurt out with a “CONGRATULATIONS” or anything like that! I would’ve been like, WTF? So, there you have it. The story of our engagement. 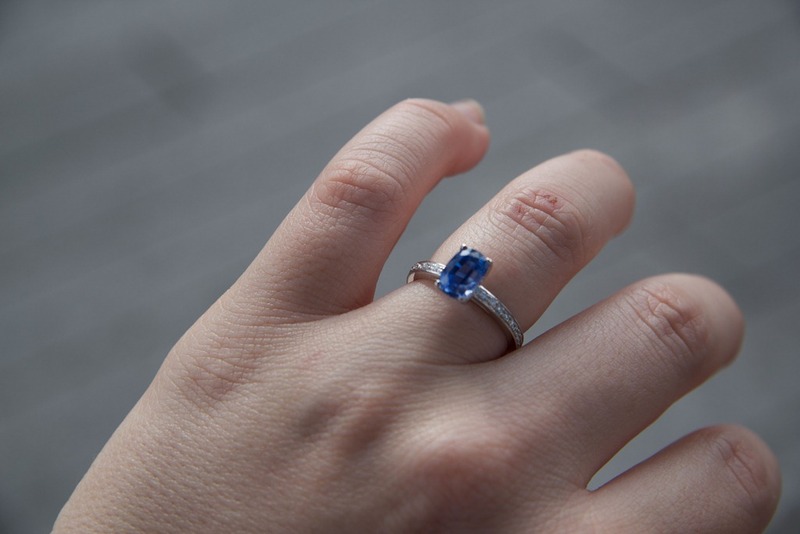 In another post, I’ll discuss the full story about finding an engagement ring, and all the hoops that Ken had to jump through to find a sapphire engagement ring! Congratulations! I love the non-traditional sapphire ring. More people should go that route really.